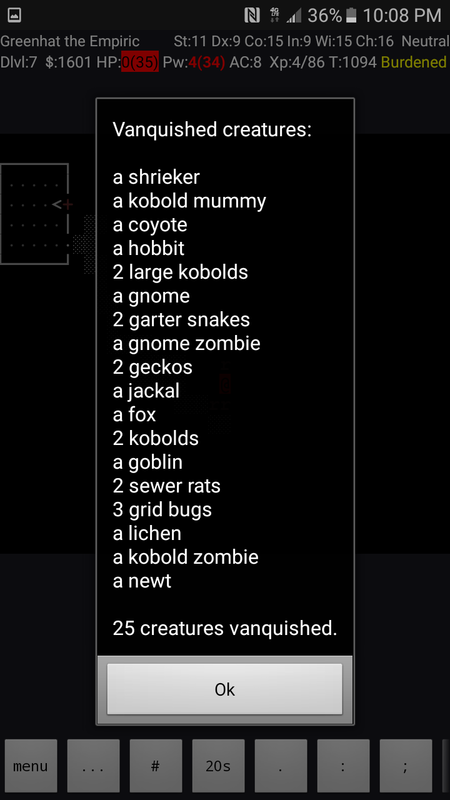 I played a bit of Nethack today and stumbled across a scroll called LEP GEX VEN ZEA. It’s fantastic! Upon reading the scroll the entire level map appears in your mind. 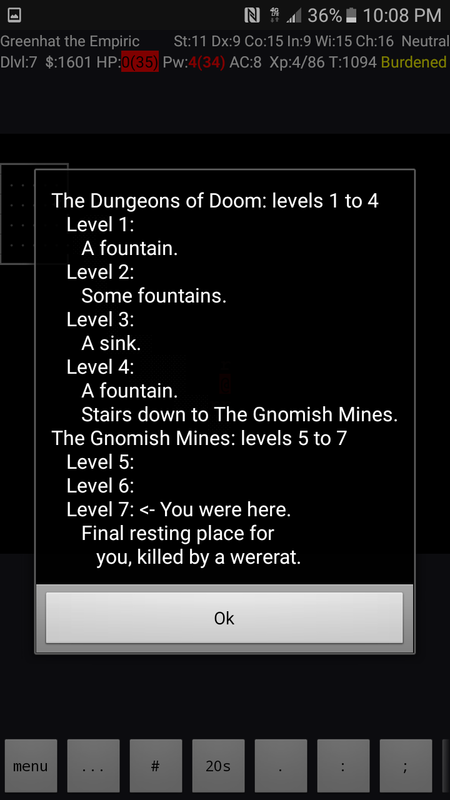 I made it through to the seventh level of the gnomish mines. For a while I thought I’d die of starvation as I had run out of edible food. Would have had to risk eating a corpse of one of the monster’s I slaughtered along the way. I dragged along a coyote corpse just in case, but came across a wererat that attacked. No problem I thought, but then the wererat called up his other wererat buddies and they had me surrounded. Cast a few healing spells and faught like hell but it was not to be. 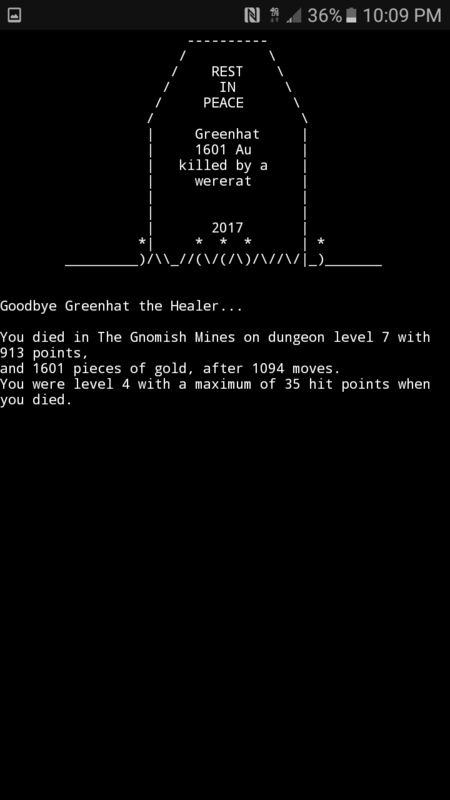 This entry was posted in Nethack and tagged Greenhat on April 13, 2017 by rubygolem. Gnarshm awoke on his bed at the inn’s royal suite in a nightmarish sweat. The gnoll was certain he had shouted in his sleep and that the inn’s maid would be checking in to make sure that the gnoll was alright in moments time. The vivid dream was still ingrained in his gnoll-ish mind. He heard the old green hatted gnome’s voice as lucidly as if he were right here in this very room speaking with him. Night after night, the dream replays in the gnoll’s mind. What does it mean? What should he do? Could it be that the old gnome was still alive after all? Gnarshm tried to remember in as many details as he could, the final moments of the battle against the tenth and final time lord. Words. Greenhat spoke an incantation as the time lord threw the old gnome into the abyss. The gnome’s voice then seemed to echo in Gnarshm’s mind, but he couldn’t make sense of the words. Neither then, nor now. Suddenly, the gnoll heard a knock on the door and the voice of the inn’s maid inquiring to the gnoll’s current state of well being. Gnarshm heard the metal key turn the lock and the door began to open with a creak. “Are you okay in there? Do you need anything?” the maid inquired. “It is alright Esmeralda. I just had another nightmare, that is all.” the gnoll replied. The maid pushed open the door further and spoke. “Were the temple priests not able to help you? Its a month’s night and yet you still have this same dream?” The maid looked worried as she wheeled through a plate of food towards the gnoll’s bedside. “I bring you your mid-day meal of tea and biscuits as you have requested sir.” Esmeralda said. “The Skeleton Head? No good will come from there, and its no good to start your day without a good meal in your belly. I’d stay clear of that place if I were you. Please. Keep your head about you for goodness sake. Besides, your tea will get cold and you are the last of our great heroes to remain at the inn now, save for that horrid kobold.” Esmeralda pleaded. “What do you mean? I spoke with Crumm just last night and I thought he had decided to stay.” Gnarshm spoke with a slight shock in his voice. “Crumm and the kobold had a bit of a falling out after you left, and the ogre decided it was best for him to leave.” the maid replied. “Darn! How can this be? It’s only been a month. I thought for sure the party would stick together longer than this.” a frustrated Gnarshm exclaimed. “I don’t suppose there might be anything that I can do sir?” Esmeralda asked. “No.” the gnoll replied, but as the maid reached the door to exit the room, Gnarshm suddenly had a change of mind. “Wait, perhaps there is something you can do. Can you send word to the hobbit Ruby? I need to speak with her. She will understand. I know she will.” the gnoll asked of the maid. “Very well sir, I will send word to Ruby to meet you in your quarters.” the maid replied. With that, the maid left to send word to the hobbit, and the gnoll left for the Skeleton Head. 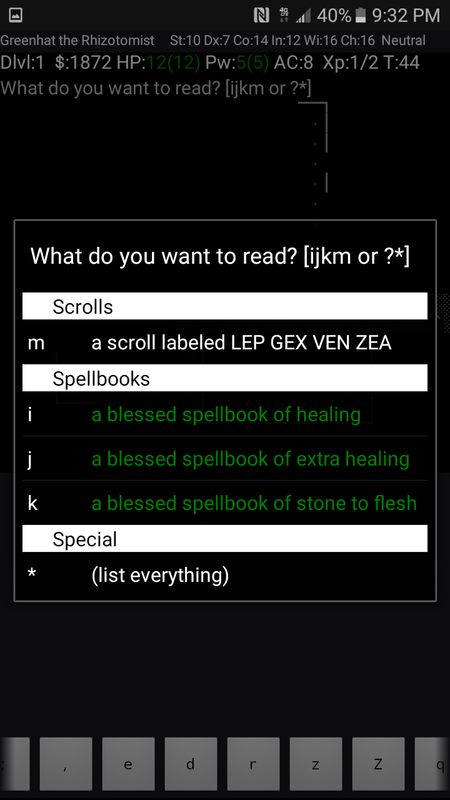 This entry was posted in Gnarshm's Dream, Story and tagged adventure, Crumm, fantasy, Gnarshm, Greenhat, Iscreem, realms of quest, retro, rpg, Story on December 28, 2014 by rubygolem. Greenhat teaches the class in the ways of magic. 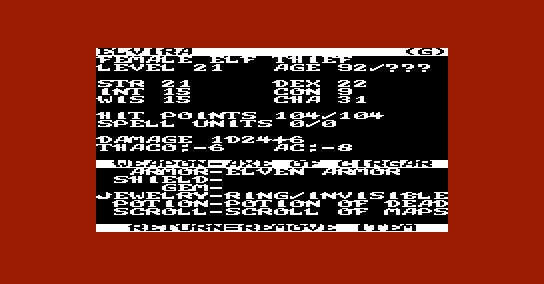 This entry was posted in RoQIV and tagged Commodore, crpg, Greenhat, map, mapping, realms of quest iv, retro, rpg, VIC-20 on November 17, 2014 by rubygolem. 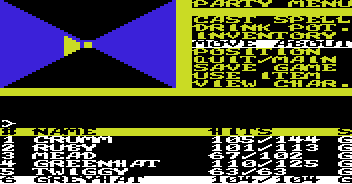 It’s been a while since I’ve played any Realms of Quest III so I wanted to make sure I still have my party backed up somewhere and sure enough, my team is safe and sound. With a new game or new version of a game, I usually find it more interesting to create a new party of characters. Just because. 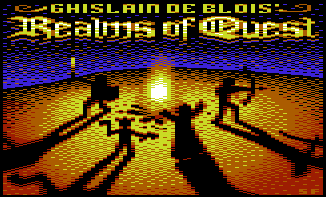 This version of Realms of Quest III: Dunjon Crawler, starts you off in a blue dunjon rather than the usual red one. Watch out though. It’s tough. 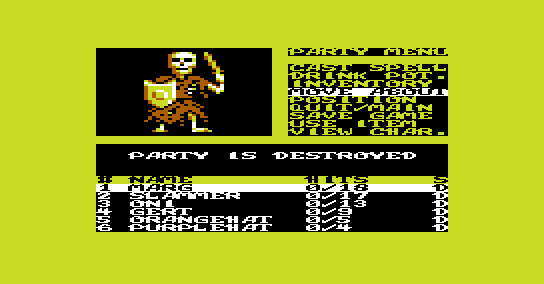 If your new party stumbles upon 11 skeletons, you might want to run away as fast as you can! Will be continuing on with Realms of Quest I + mapping out it’s dungeons soon. Just wanted to try out a bit of Dunjon Crawler for a change. Really like these party based games. This entry was posted in RoQIII and tagged crpg, Greenhat, Purplehat, realms of quest, realms of quest III on October 25, 2014 by rubygolem. 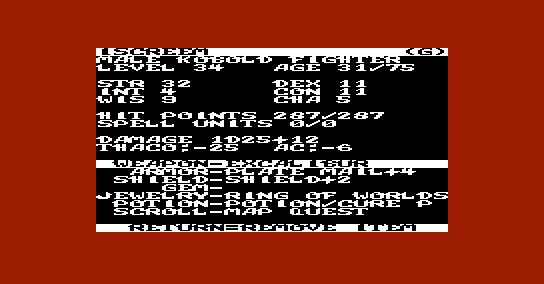 Just a few final words in regards to Realms of Quest IV…. It’s FUN! Plain and simple. 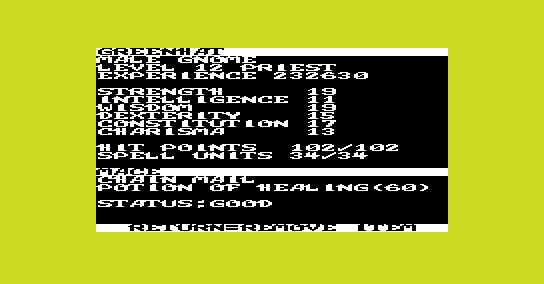 It’s a classic style CRPG made for the Commodore VIC-20 computer for the year 2014. Besides the usual character races, there are also (Gnoll, Kobold, Ogre, Orc and Sprite). 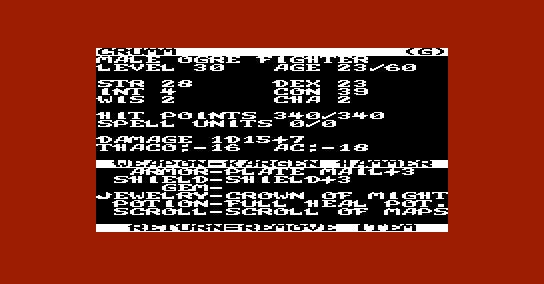 It features many of the classic dungeon crawling goodies that the older CRPG’s featured in regards to gameplay……(turn based combat, grid/square based movement, and many features that were featured in early CRPGs…. [darkness zones, pits, teleporters, spinners and many, many monsters that would like nothing better than to slice you up into little pieces and devour your living flesh in a monstrous celebration of your very own peril and demise]). The deeper you descend, the more treacherous and evil creatures you will encounter, so you must be ready for absolutely anything that these vile dungeons throw at you. Part of what makes this game so much fun is the need to map out each dungeon level, so get your graphing paper and pencils ready for adventure and exploration. 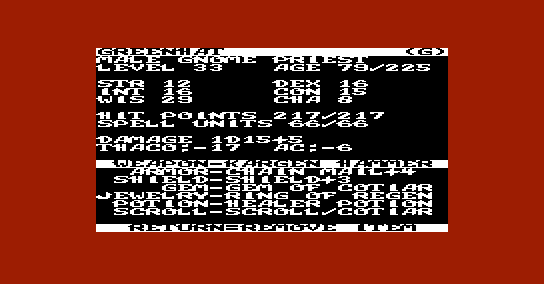 I recommend that you map out the levels on your own rather than relying on the maps that I have uploaded to this blog, but if you prefer to view the maps they are online here via Gnarshm’s book of cartography category. 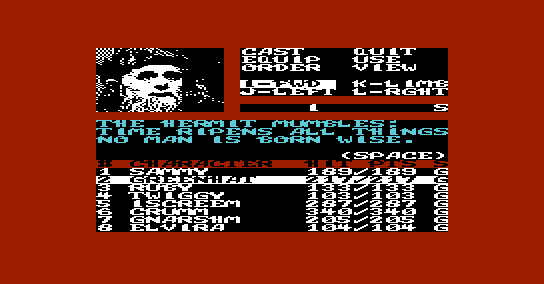 Realms of Quest IV has many monsters and a variety of ways to go about fighting and slaying them, and defeating the Time Lords. I’d recommend that you try to roll up as many Lord’s as possible during party creation when creating your team. The more spellcasters (both wizard and priest) you have, the easier it will be to defeat the 10 Time lords. You will need a Thief or Ninja in order to disarm traps, and you will need some warrior tank-ish types for their high HP in order to survive some tough battles. (Mainly) A final completion screen. 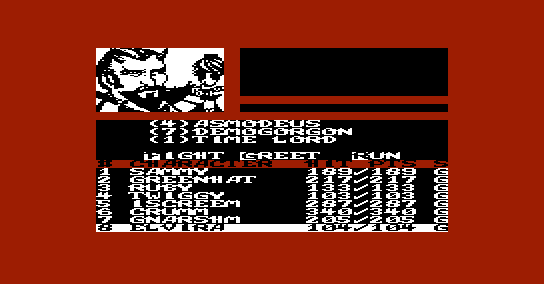 When you beat the game, you defeat the final 10th time lord and obtain a Staff of Orcus and a whole bunch of gold and XP, but what was missing is something that indicated that the game was finally over. Even just some basic text to display on the screen to say that the 10 time lords have now been defeated, the realms have been saved, and the party is triumphant! would suffice. 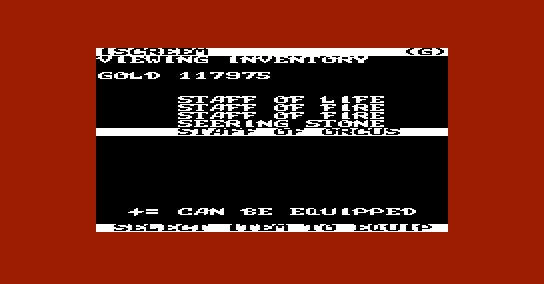 This is probably likely due to the limited memory available with the VIC-20. 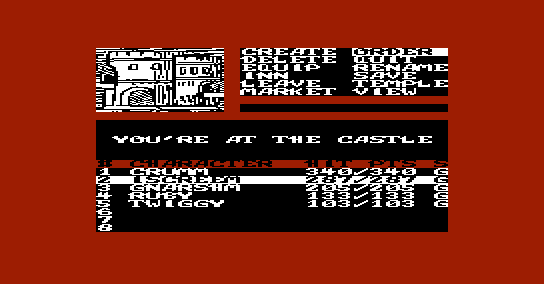 In previous versions of the game, there was no splash screen and no music, which later versions of the game had incorporated those features after condensing the code to make way to allow these features, so in my opinion, I’m glad to have the splash screen and music than a final end screen but without some notification that the game’s major plot has been finished it sort of leaves you with a question of whether or not you have really completed the game. More Trap additions (while exploring the dungeon) like falling rocks or poison needles or other surprise damage attacks onto the party that either do heavy damage to the party or inflict the party with poison effects or other afflictions (turn character to stone, charm character so that character attacks other party members, or even traps or spells of high level monsters that disintegrate/destroy/eliminate a party member outright). These are all just my personal suggestions so take them with a grain of salt. Not even sure all those features would even be feasible with the limited resources of the VIC-20. 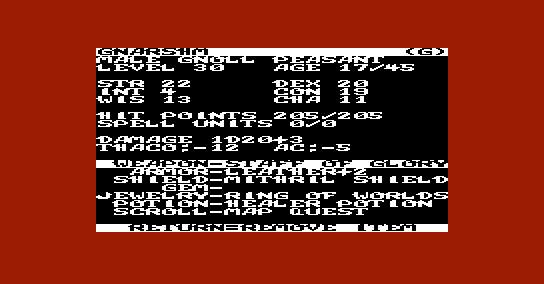 + Now, I present my final character screenshots of my team at the end of the Realms of Quest IV game. Now if you haven’t gone out and obtained Realms of Quest for yourself, you can do so at the following link. 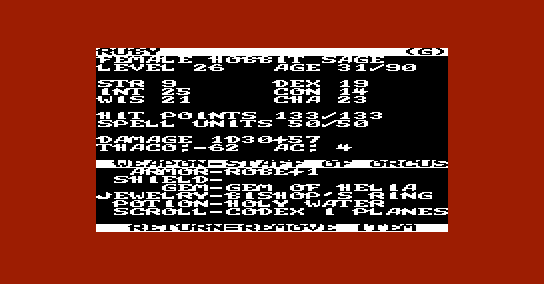 This entry was posted in Note, RoQIV, Uncategorized and tagged Commodore, crpg, Crumm, Gnarshm, Greenhat, Iscreem, realms of quest, realms of quest iv, retro, rpg, Ruby, ruby golem, rubygolem, Sammy, Twiggy, VIC-20 on June 14, 2014 by rubygolem. With fearless determination, the party marched onwards after locating the black key in the middle of the “B”, and reached the blackened door of the tenth Time Lord, which Gnarshm marked on his book of cartography with the letter “G”. The door was adorned with skulls, dripping with blood and emanated an essence of pure evil. With weapons drawn and spells at the ready, the elven thief Elvira inserted the last and final black key and opened the door. A cold icy frost drifted outwards sending a vile chill onto the adventurers. Further into the lair the adventurers stepped, inch by inch as a feeling of dread overwhelmed the party until a wretched voice seeped into their brains. “You have defeated the other nine lord’s but you will not beat me. Now, prepare to meet your maker and die!” the tenth Time Lord appeared out of the darkness with a staff of orcus, slamming the staff on the floor with a loud and enormous THUD. The floor began to shake and crumble. Bits of the stone floor wasted away revealing a gaping pit into a hellish abyss below. Fire erupted sending flames outward and upward scorching the party whilst demons from the hell below reached towards the adventurers with bloodied claws. The Time Lord sent shockwaves of lightning at the party. Elvira took the brunt of the attack and her skin lit afire and began to burn while the summoned demons took away the rest of her burning flesh into the depths below. Sammy leapt into action slashing violently against the time lord with her blade but her hand was grasped by the evil lord and her blade was sent backwards piercing a hole through her armor and through to the other side of her now dying body. The time lord pushed her too, into the fiery abyss. The remaining party fought back valiantly against the summoned asmodeus and demogorgons. Iscreem pulled the stolen gem of meteors from his pocket. “Well, its now or never. Lets do this now! he shouted as he threw the gem towards the enemies. The gemstone shattered and blew a hole through the ceiling of the dungeon. Moments later the dungeon filled with stars and meteors which ricocheted throughout the dungeon, throwing a wild bombardment of starlike meteors onto the vile demons eliminating the cruel asmodeus. “My God, it’s full of stars!” Iscreem shouted as the gem of meteors rocketed through and tore apart the demon’s evil flesh. The rest of the party launched a full on attack against the Time Lord and the remaining demogorgons. With the remaining demons laid waste, Crumm and the rest of the party focus their attacks on the final vile and last Time Lord. Wounded and dying, the tenth Time Lord struggles profusely and manages one last attack against the party. The Time Lord grasped violently at the old gnome. With Greenhat’s throat clasped in the wretched Time Lord’s Hands, the evil lord threw the green hatted gnome into the endless fire scorched and hellish pit below. Greenhat let out a final shout of defeat as he fell into the abyss, his voice seemed to eternally echo in Gnarshm’s mind as the old gnome fell into the Time Lord’s blackened void. Gnarshm and Iscreem lunged at the Time Lord in unison, with Iscreem dealing the final blow against the tenth Time Lord. With the blade of excalibur plunged deep into the the Time Lord’s belly, the wretched lord let out a fatal scream as his flesh disintegrated and fell to the ground as a heap of dust and ash and the staff that the time lord held fell to the floor in a clatter. Iscreem was still in shock at having defeated the final Time Lord as he looked onto the remaining party members. It was finally over. The ten Time Lords have been defeated. The party gathered around the kobold warrior and expressed their sorrow over losing three of their adventuring companions to the evil Time Lord. Ruby found a golden chest on the far end of the room which contained a large and valuable loot of gold and Iscreem picked up the staff of the fallen Time Lord. The remaining party members made their way back to the castle, triumphant in their defeating of the ten Time Lord’s but in sorrow for having lost Greenhat, Sammy and Elvira to the Time Lord. Iscreem let a tear fall from his eye. It was the first time that any of the party had seen him in a moment of true sorrow. “Don’t feel too bad. The old gnome would have been proud of our accomplishment. We set out to defeat the ten Time Lord’s and that is exactly what we did.” Ruby said to try to comfort the kobold warrior. Twiggy patted the kobold on the back. “We defeated a great evil, and you still have us. Life goes on. It is the way of things.” the elf wizard said. “It can’t be over just yet, we never did get to see the royal wine cellars, did we? or go horseback riding.” Gnarshm asked. “Here we go again.” Crumm mumbled. Iscreem replied with a smile on his face. “Don’t worry Gnarshm, with the vast amount of gold that we looted from the Time Lords, you’d be able to buy a wine cellar of your own and fill it with as many bottles as you can fit into it. Now where is that tavern anyway? I’ve got some coins to spend now too.” the kobold said with a sly grin. 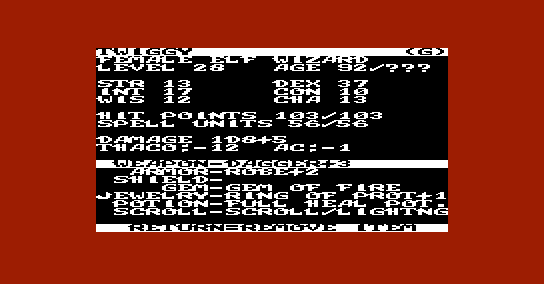 This entry was posted in Party Characters, RoQIV, Story, Time Lord and tagged Commodore, crpg, Crumm, Gnarshm, Greenhat, Iscreem, realms of quest iv, retro, rpg, Ruby, ruby golem, rubygolem, Sammy, Story, Time Lord #10, Twiggy, VIC-20 on May 26, 2014 by rubygolem. Having recuperated for a month at the castle’s inn after an extensive exploration of the dungeons below, the party was again ready to descend through the labyrinth, but this time the party would traverse to the final level of the Time Lord’s Lair. Gnarshm had come a long way from his meager beginnings as a young and quite naive peasant, and was now just as battle ready and as armed to the teeth as his kobold warrior companion, Iscreem. Ruby and Twiggy had their spells memorized after extensive hours of studying the runes of their spellbooks, while Crumm and Sammy spent their time sharpening their blades whilst fixing and fitting their armor. Elvira was growing impatient with all of this studying and preparation, and was ready to take on the final time lord all by herself by the time the rest of the party was again ready to descend the dungeons dark depths. She stopped and peered at the old gnome with sudden interest when she found him chanting and uttering strange words and incantations of a language thought to have been long forgotten in this time and age. “What are you doing?” she asked the gnome. “Please be quiet. I must have full concentration for this.” Greenhat muttered in response to the rogue elf’s inquiry. The gnome continued his spell and spoke in strange tongues while reading runes from an ancient looking manuscript. The party gathered around the gnome as his voice began to alter and distort in ways that seemed incomprehensible and otherworldly. The gnome’s face began to strain painfully as he grew visibly weak . Before long a loud noise began to rumble and echo through the halls, then the dungeon walls began to shake. A fiery red force emblazed a circle in front of the old gnome as the wall in front of him began to melt and drizzle to the dirty stone floor below. Before the party now shone a waving mystical portal to a location unknown. It’s power was great and energy emanated from the circle of its gate. “Step through the portal.” the old gnome said. Elvira hesitated. A sense of fear overwhelmed her as did the rest of the party. “Do not fear. Step through the portal. Do it NOW!” I cannot keep the gate open for long!” Greenhat warned as his body began to shake as he grew weaker from the spell’s powerful effect. One by one the party stepped through the gate with the old gnome making the final step through the portal’s passage. On the other side, the party arrived at a dark blackened corridor and the gate quickly evaporated into nothingness as if it had never been there at all. “What was that? Where are we?” Gnarshm asked inquisitively. “I opened a gate to bring us directly to the Time Lord’s tenth level. 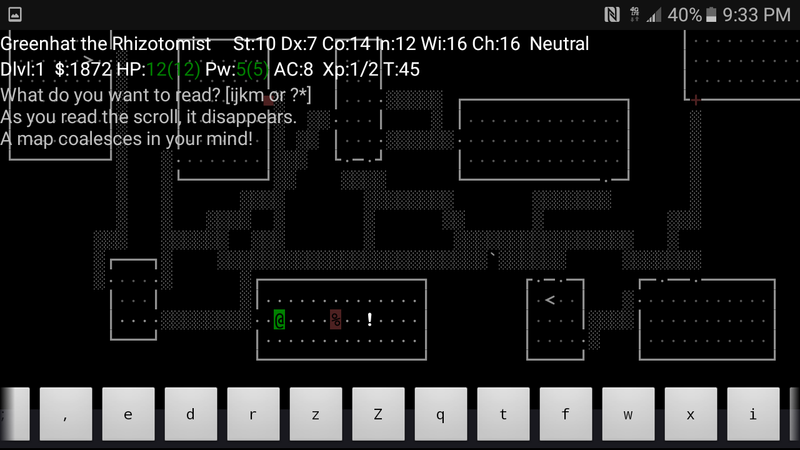 We are now at the deepest and darkest part of the dungeon. This is where we must face the last of the Time Lords.” Greenhat stated as his voice trembled. The gnome had trouble standing and nearly collapsed but Crumm grabbed him and held him up with the support of his brutish muscled arms. “Am I dreaming? Is this for real? How come you didn’t think of doing this before?” Elvira asked. “Foolish elf! Do you think I can just summon us a gate and teleport us here and there willy nilly anytime I so choose? It took me years just to decipher the ancient language the spell was written in, all of my strength and determination to cast the spell, and to be perfectly honest, I don’t think I could do it again.” Greenhat said wearily. Iscreem began to hear footsteps encroaching towards the party from the corridor’s southern end. “Someone is coming.” the kobold whispered to the group as he unsheathed the sword given to him by the lady in the water. The rest of the party assembled into battle formation in the darkened passage aside the kobold warrior, when suddenly a spark of light flared and a torch was lit by a strange looking fellow that approached the party. “Who are you? What are you doing here?” the fellow demanded. His face was weathered and aged and he sported a long greyish white beard. “You are not monsters. You shouldn’t be here. Its not safe for you to be here.” the old fellow continued. “We are here to kill the last of the Time Lords. Could you tell us where we can finds him. The blade of my sword has got his name written all over it.” the kobold announced. “Please sir, we have traveled many passages and so many levels of this wretched place. We need to find the last Time Lord and put an end to his evil once and for all. Any assistance you can give us would be greatly appreciated.” Ruby said hopefully. “Well do what you will, but I would highly advise you to not seek him out. Even if you do find him, I doubt that you will survive, but if you absolutely must find him…..” the fellow trailed off. “We must.” Gnarshm stated confidently. “Very well then. You will need a dark black key to enter his lair. Before you do anything, take this tome and read it. Then seriously reconsider what you are about to do. Time ripens all things, no man is born wise. That is all I have to say to you. Goodbye, and if you absolutely must, then good luck also.” And with that the fellow departed, leaving the tome for the party to read. “I can’t reads this thing. Its written in strange runes. 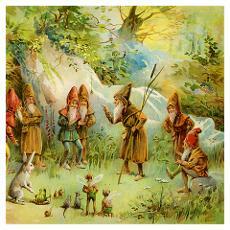 Give it to the gnome to read.” Iscreem passed the tome to Greenhat. The old gnome read the tome to himself. A worried look swept over him. “Maybe that old hermit was right. Maybe we should leave while we still can. If we do end up finding the last Time Lord, it is very possible that some of us, or even all of us may not survive. Are we ready for this? Is everyone here ready? Decide now because there will be no turning back.” the old gnome warned. After a few moments to think it over, it was settled. The party would face the final Time Lord in a fight to the death. 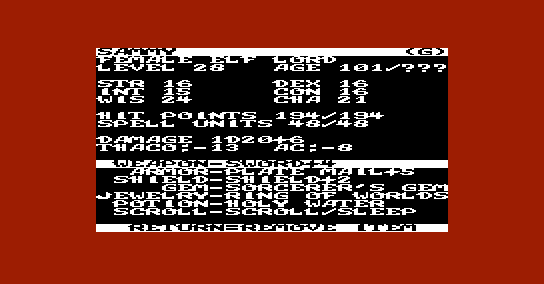 This entry was posted in Party Characters, RoQIV, Story and tagged Commodore, crpg, Crumm, Gnarshm, Greenhat, Iscreem, realms of quest iv, rpg, ruby golem, Story, Twiggy, VIC-20 on May 25, 2014 by rubygolem.